The name comes from the Koine Greek ἀμέθυστος amethystos from ἀ- a-, “not” and μεθύσκω methysko / μεθύω methyo, “intoxicate”, a reference to the belief that the stone protected its owner from drunkenness. 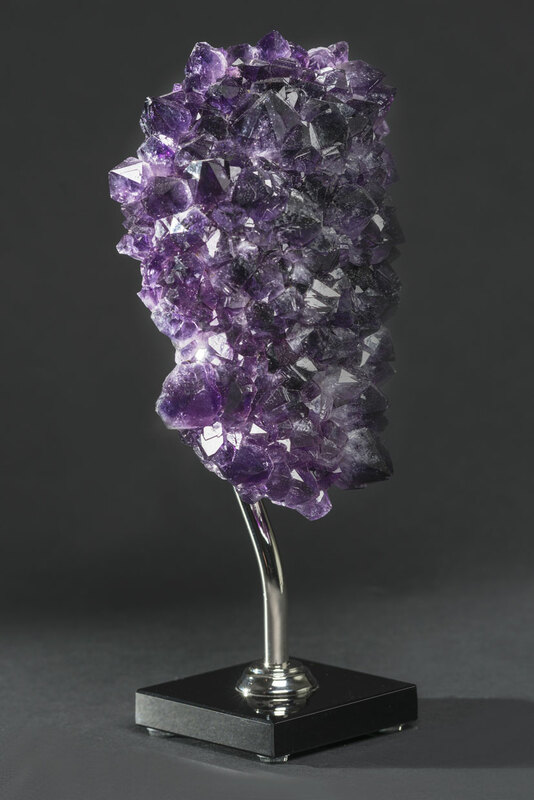 The ancient Greeks wore amethyst and carved drinking vessels from it in the belief that it would prevent intoxication. The Greek word “amethystos” may be translated as “not drunken”, from Greek a-, “not” + methustos, “intoxicated”. 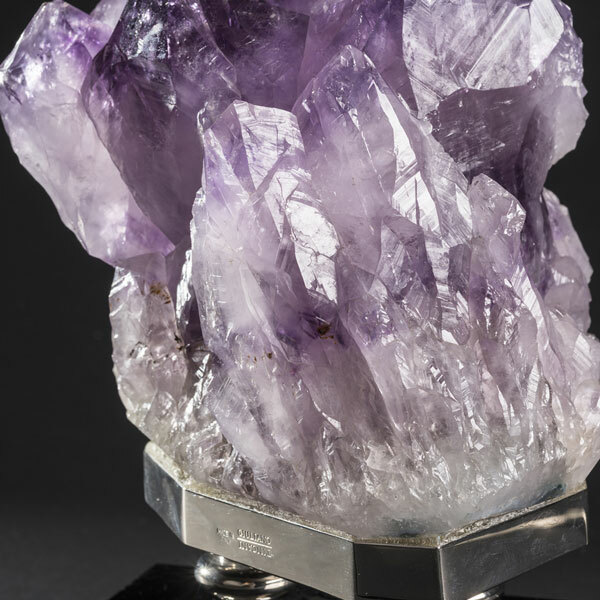 Amethyst was considered to be a strong antidote against drunkenness, which is why wine goblets were often carved from it. In his poem “L’Amethyste, ou les Amours de Bacchus et d’Amethyste” (Amethyst or the loves of Bacchus and Amethyste), the French poet Remy Belleau (1528–1577) invented a myth in which Bacchus, the god of intoxication, of wine, and grapes was pursuing a maiden named Amethyste, who refused his affections. Amethyste prayed to the gods to remain chaste, a prayer which the chaste goddess Diana answered, transforming her into a white stone. Humbled by Amethyste’s desire to remain chaste, Bacchus poured wine over the stone as an offering, dyeing the crystals purple. Variations of the story include that Dionysus had been insulted by a mortal and swore to slay the next mortal who crossed his path, creating fierce tigers to carry out his wrath. The mortal turned out to be a beautiful young woman, Amethystos, who was on her way to pay tribute to Artemis. Her life was spared by Artemis, who transformed the maiden into a statue of pure crystalline quartz to protect her from the brutal claws. Dionysus wept tears of wine in remorse for his action at the sight of the beautiful statue. The god’s tears then stained the quartz purple. This myth and its variations are not found in classical sources. However, the titan Rhea does present Dionysus with an amethyst stone to preserve the wine-drinker’s sanity in historical text. Tibetans consider amethyst sacred to the Buddha and make prayer beads from it. 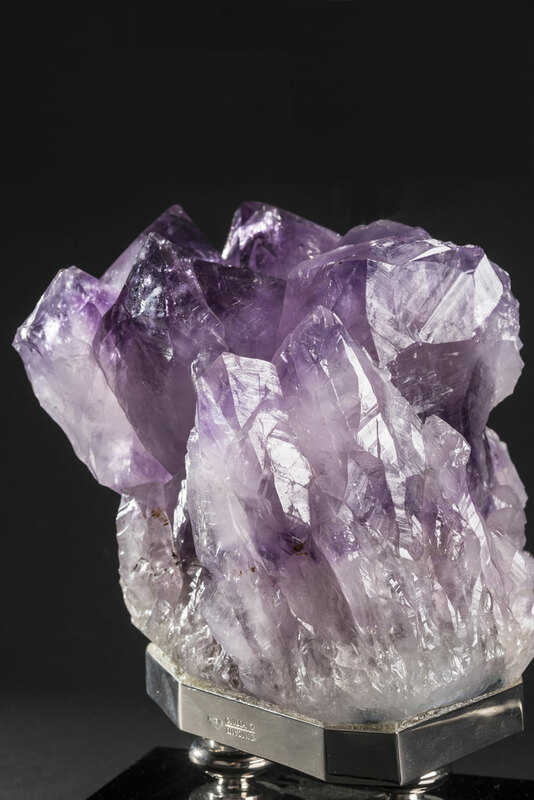 Amethyst is considered the birthstone of February. In the Middle Ages, it was considered a symbol of royalty and used to decorate English regalia. 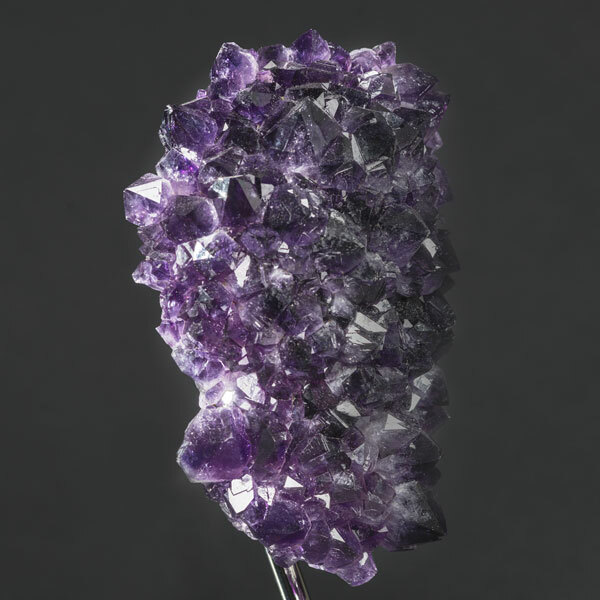 In the Old World, amethyst was considered one of the Cardinal gems, in that it was one of the five gemstones considered precious above all others, until large deposits were found in Brazil.